In George Orwell’s 1984 the state had something like a TV in every room that was two way. 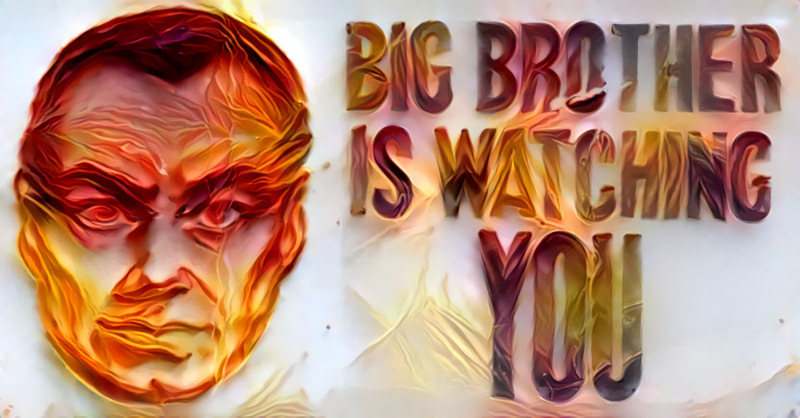 There could be someone watching or listening to you at any time, and therefore you could not assume that it was safe to talk about any critical views of the state without being monitored. This vision has essentially become reality, but with vastly larger scope. Almost every device you own can now see and hear. You phone can be used to listen in to conversations and track your movements. Your ‘Smart TV’ can be hacked to record video and audio. There are now ‘smart speakers’ such as the Amazon Echo which records private conversations at home. Police are already seeking to use this technological surveillance. In 2016 Amazon received a warrant for data collected by a Echo in the home of the alleged murderer of Victor Collins. Amazon claims that while the Echo is always listening for its wake up command it does not send anything back to Amazon until it hears the wake up command. This month it became evident how easily voices can be recorded and transmitted when a Portland families private conversation was recorded and sent to another party without their permission. Despite protests from Amazon that the Echo cannot be used to eavesdrop on its customers it is well known from Edward Snowden’s released documents that the NSA has run programs designed to compromise peoples devices. From ‘Smart Phones’ to ‘Smart TVs’ to ‘Smart Speakers’, each of them has the technical capacity to spy on you without your knowledge or permission. Tech companies have scrambled to assure customers of their privacy, but we are still at the mercy of those implementing the security. And they are at the mercy of a Government which can impose secret orders. But secret surveillance is nothing compared to open surveillance. Everything you do online is tracked and recorded by multinational corporations. They know who all your friends are, what you search for, what you post on social media, where you have been and what you have purchased. The companies who collect this information do so in the open, with your consent. While the deconstruction of privacy began online it is now creeping into every aspect of our lives. Android phones track your everywhere you go. In the UK there has been widespread deployment of surveillance cameras. These systems no longer need armies of people watching them with the advent of facial recognition systems. Even in New Zealand we have begun to see supermarkets like New World implement facial recognition in their stores to identify known shoplifters. In a recent case Daniel Ryan from Dunedin was misidentified by such a system as a shoplifter. Think of the possibilities as these systems are able to identify shoppers, how they move through their stores and what they buy. In Hangzhou City, China, cameras in front of classrooms take pictures of students every thirty seconds. These images are then processed by an artificial intelligence which detects the mood of the students. It is able to determine which students are being surprised, sad, antipathy, angry, happy or afraid. China has already broadly deployed facial recognition technology in school cafeterias to make payments easier, to prevent toilet paper theft at public restrooms and as a virtual boarding pass for airline flights. The real game changer however has not just been the ability to collect surveillance data, but the ability to process it. Surveillance is not just about a tyrannical state finding those pesky dissidents. It is about putting that data to use in order to influence the decisions people make. The essential reason internet corporations are collecting vast amounts of data is to train artificial neural networks to exploit you. Advertising has always existed to influence customers, but never has such ruthlessness efficiency been applied. Impersonal advertising is now tailored to the individual, along with the price you are offered. While Google started with recording everything you search for and click on they have taken it into the real world by using your phone to track everywhere you go. Go into your local supermarket and your phone will be ask you to take pictures of the interior. You will be asked questions about the supermarket and asked to rank it. Have you stopped to think about what this data will be used for? This combination of pervasive surveillance, big data and artificial neural networks has opened the door to terrifying new applications. We have seen the tip of the iceberg recently with how Cambridge Analytica used data from Facebook to target specific voters with specific advertising. Cambridge Analytica were able to use simple Facebook games to encourage people to approve of data about them and their friends being shared. This data was used to identify critical voters in an election, and then to customize advertising that would be maximally persuasive for those voters. It is certainly concerning that Governments have continued to treat privacy with contempt, passing surveillance legislation to legitimize the interception of what should be private conversations in the face of the disclosures from Snowden. But so to is the way the public has been willing and cooperative with the efforts of corporations to collect and exploit the data they collect for private profit. real world surveillance today is far more pervasive and powerful than Orwell could have ever imagined.